The remarkable story of the Godmanchester Stirling bomber which crashed on return from a Bomber Command raid to Essen in April 1942. On 11 April 1942, a stricken Short Stirling Royal Air Force bomber crashes into fields to the east of Godmanchester in Cambridgeshire, England. Hours earlier the commitment and skill of the crew had been tested to the limit confronting the formidable searchlight and flak defences of the German city of Essen. This event, hidden for so long, had drifted into the fog of history, but a chance email led to this amazing story revealing itself. An epic tale of a wealthy young man, whose mother died during his birth, who lived for excitement, and who went on to join the RAF in 1938. Matthew Drummond Henderson Wilson went on to become a Ferry pilot, a Flying Instructor and finally a Test pilot. In October 1941, he joined RAF Bomber Command's No. XV Squadron becoming a Squadron Leader, and taking part in numerous raids on Brest and the Ruhr. Stirling to Essen is also the story of the men who served alongside their pilot, and the unbreakable bond of friendship they found as they soared over the deadly skies of the Third Reich and occupied Europe. What became of these men, did fate smile upon them or was luck to desert them? Time and again new and unexpected stories came to light, embroidering the already rich tapestry. 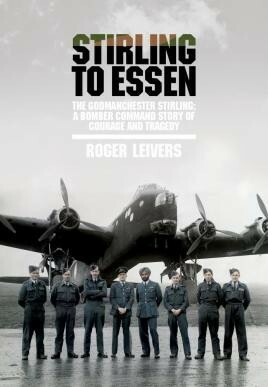 Author Roger Leivers' meticulous and comprehensive research has brought to life the remarkable story of the Godmanchester Stirling. A story of friendship, bravery, and sacrifice, acted out against the nightly threat of never returning to this sceptred isle again. I have a great many books on RAF Bomber Command, this ranks as one of the very best. A book definitely not to be missed. I thoroughly recommend you to get a copy of the book...I know my father is going to enjoy this equally as much as me because he was there! Fighting High and Roger have done an excellent job and I highly recommend this book for anyone interested in RAF Bomber Command, the Short Stirling aircraft, and what it must have been like flying in those dark skies facing danger on a regular basis. This is the book of the year for me and for many of you it should be as well. Leivers writes very much in the style of Martin Middlebrook, empathising with his subjects and having done much detailed research, and his passion is infectious. Anyone interested in Bomber Command would enjoy this and it is a rich addition to the existing archive on this topic. This is the kind of story one would expect to have been showcased in one of the 1960s/1970s/1980s war comics such as Warlord etc. It's an inspirational and deeply fascinating story of a man and his aircraft, together with the crew who shared his adventures with him. Larger than life but all true. Amazing! A story of heroism, friendships, loyalties, the intense bond they felt as a crew and, ultimately, the results of that unbelievably fickle finger of fate that controlled their destinies. This is an interesting story which puts the pieces of a jigsaw together, the individual stories of a bomber crew during WW2 along with the missions of XV squadron, the targets that were attracting the attention of bomber command at that stage of the war and a local aspect of what it meant to follow up the story of a wartime crash at Godmanchester.